My first experience in a commercial bear hide. The aim was actually not photography, but the chance to show my children a wild bear. Yes, there was three of us in the hide. Me, my daughter (8 years old) and my son (5 years old). With little help (Thank you Erik!) I was able to find a hide that resembled the wild conditions as much as possible. That meant no carcasses lying around, no bears used to humans, no trampled foregrounds. The bears visited our hide four times this evening, each time not more than for a minute. Just strolling around, looking for small pieces of food that had been put out by the owner. The only downside (well for me) was that the shooting holes were quite high. That might be okay on some occasions, but still I would like to choose my angle of shooting. 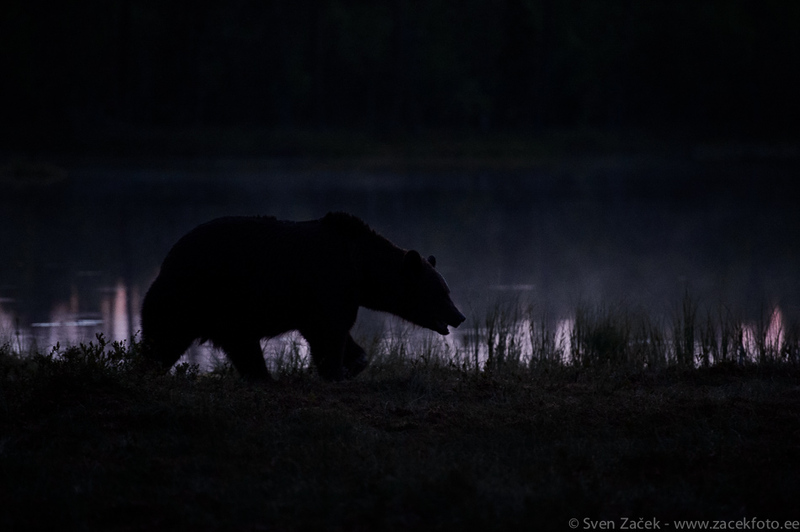 For this picture, taken two hours after sunset, the high angle was okay, because it silhouetted the bear against a small forest lake. Photo info - Summer: : Niko D4s + Nikkor 70-200mm F2.8 VRII @ 200mm. F2,8, 1/160, ISO 6400.